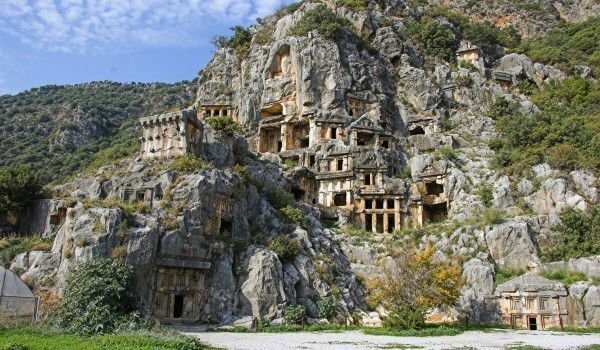 Myra Rock Tombs are extreme archaeological wealth of southwestern Turkey. Tombs are unique view of Myra - carved in a huge rock and date back to the Lycian kingdom of 4-3 century. Rock Tombs Myra today are known by the name of Demre and Kale, they are located 25 km west of the town of Finike. All the ancient tombs of the ancient city of Lycia look directly against an ancient theater from Roman times. Located in the Turkish province of Antalya, and hence river Myros. In the fourth century in Patara was born Saint Nicholas, who became bishop of Myra and died there in 345 year. In his lifetime Saint Nicholas was known for his ability to cure people of incurable diseases. Along with rock tombs Myra is the church where St. Nicholas served and in which were saved relics of the saint to depart in the town of Bari. The church has an interesting monument of the Saint Nicholas, as well as an impressive monument of a Turkish admiral. The whole area of Calais is a beautiful park with tropical plants. Later, the image of St. Nicholas was transformed into a beloved Santa Claus. In his memory every December hosts the Festival of Saint Nicholas and tourists from around the world come to spend their Christmas vacation on the sunny Mediterranean coast of ancient Lycia. Church of St. Nicholas in Myra was destroyed by earthquakes and raids on several occasions and last lifted in 1042. It can be seen already faded, but with reserved seats of frescoes. Myra Rock Tombs are carved in soft molded boulder with 4 lion heads at each corner. It still keeps the secret of its 8 unresolved Ancient Lycian sentences. It is known as Tomb of the King. Four borders outlining the contours of the opening of Lycian tombs symbolize the 4 doors to another world in which to move. They resemble rather built arches like those of medieval Christian churches. In fact, the number 4 is a digital image of the cross. Demre town is located 48 miles east of Kas and about 140 km west of Antalya. Mira rock tombs themselves are located 2 kilometers away. In two rock tombs necropolis - Necropolis of the river (river-necropolis) and the necropolis of the ocean (the ocean-necropolis). The ocean cemetery is located northwest of the Roman Theatre. The most famous rock tomb of the river is called Necropolis. Tomb of the lion or Painted Tomb, which in 19 century was colored blue, red and yellow. The history of the ancient city of Lycia began sometime during the 5 th century BC, but the rise of Myra, a city, about 2 century BC. Over 141 years Myra is almost entirely destroyed by an earthquake, but later recovered. Some Myra Rock Tombs are the remains of Andriake, which is the ancient port of Lycians. The port is still planned at the time of Trajan, but realized in the southern part of Myra between the management of Hadrian. Today the harbor is a favorite of tourists who fill the few coastal restaurants here.